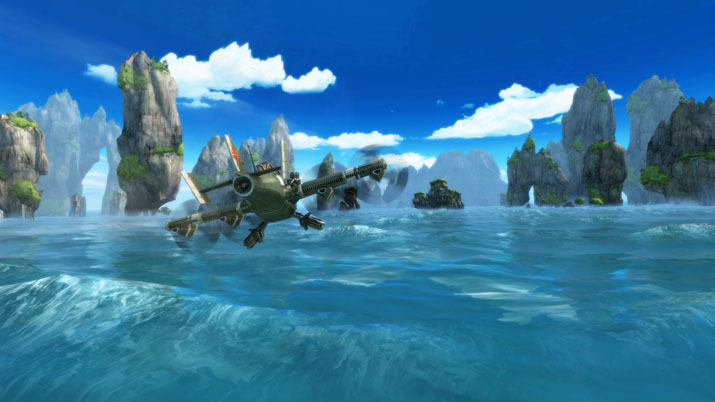 Sine Mora EX is a bullet-hell, side-scrolling shooter that features stunning graphics, a story, various gameplay modes, and unlockables. It is an upgrade from Sine Mora, which the steam store no longer sells; any owner of Sine Mora receives this updated version for free. The path ahead is treacherous and replete with action, as are all bullet-hells. Not unlike other bullet-hell shooters, this one demands your full attention. While you don’t have a health bar in the traditional sense, you do have a time limit that depletes as you take damage. Checkpoints restore your time to a set amount, drops from enemies, and killing an enemy, can increase your current time. Other drops upgrade your firepower or resupply your sub-weapon. Upgrades to your firepower are permanent, but you lose these upgrades if you receive damage, though for a limited amount of time, you may reclaim the lost firepower. I’d like to know how exactly these upgrades are permanent, as beginning a stage within any mode reverts your power back, as if you didn’t acquire upgrades. The only sense in which I’ve seen this as permanent is that when you die during a stage, your firepower is restored to the level you had it when beginning that section. Die too many times, however, and it’s game over. Power is easy to level up during a stage, but the difference between just a few points of firepower and having it nearly maxed is a huge chasm. 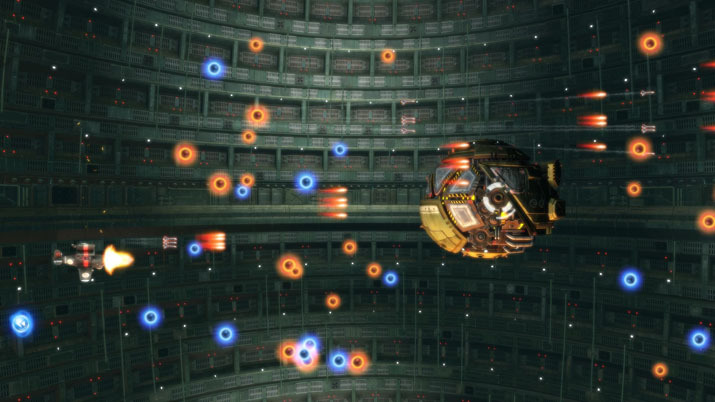 If your firepower is near max, you can easily decimate parts of a boss in mere seconds. If it is low, expect to stay there for a decent length of time, which can easily spell death, if you aren’t careful. The beginning of stage three, for example, with just one point of power, barely affords you enough time to kill the first round of bots and proceed with the rest of the stage, especially if you take any damage. Your main weapon doesn’t have limited ammo about which you must worry. You also have a sub-weapon, which varies by plane, and a capsule that has a limited charge. This capsule ranges from the ability to slow down time around you when you find yourself in a sticky situation, to reflecting enemy bullets back at them, to turning back time, even if enemies destroy your plane. In story mode, only the capsule to slow time around you is available. Certain achievements require using the other capsules, so try everything for that reason and to see what works. Particular achievements require that you finish a stage with a high rating. Nearly all achievements you’ll unlock in sequential order. Part of the criteria for the second one requires that you’ve obtained the prior achievement first. There’s a co-op option in the story and versus modes, but a second person is necessary for any co-op play (you cannot play against an AI in versus). Challenges are quite difficult. For the first one, you have just over ten seconds to survive a sizeable duration of time, while avoiding a screenful of mines, while also hitting yellow mines to add precious time — but you aren’t permitted to destroy red mines. That’s just for the first one. I wouldn’t want to see the last challenge this title offers. Sure, bullet-hells are supposed to pose a challenge, but my perseverance only goes so far. As you familiarize yourself with a stage more, difficulty declines. Bosses and normal enemies have predetermined flight and attack patterns, and the structure of the map doesn’t change. Avoiding a barrage of incoming missiles is nevertheless still hard, but one piece of advice that’s helped me in sticky situations is to concentrate on your ship, while occasionally glancing down the screen. Know where your target is and its trajectory, then just focus on your ship to dodge what’s coming. It’s harder to see thinner missiles, along with certain missiles shot underwater or through the smoke of an explosion, making concentration and quick reflexes a must. Sine Mora Ex is fun, albeit frustrating. Continues prove handy, but sometimes the amount (in the harder difficulty especially) is simply not enough. Simply put, you just have to continue to play and suffer through seeing your plane explode to become better. This occurs naturally, since not much of anything changes upon subsequent playthroughs (save for enemy resistance, which depends on rank). If you’re up for a challenge and enjoy this genre, you’ll enjoy this without a doubt.